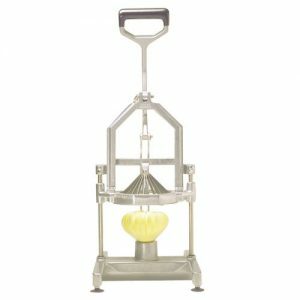 #5280M Gold Medal Fry Cutter – Motorized | Pronto Pup Co., Inc.
Makes the NEW “Tornado Potato” or “Saratoga Swirls” which is a spiral cut deep fried potato on a stick. Click on “enlarge photo” and see how it works. All you do is skewer a raw potato insert into the Fry Cutter and push through. Then spread out the raw spiral cut potato on the skewer, then deep fry – Yum! Fry Cutter comes with three different blades to make either “Ribbon Fries” (thin blade) or “Curly Fries” (medium and coarse blades). Approx. 100 watts, .73 amps, 120 volt.